Congratulations! What an honor. I'm proud of you. Thanks for sharing the information about the sessions you attended. I am going to think about dealing with late papers in a different way. If I could give detention to my college freshmen, it would help me a lot! Congrats on your well-deserved award! I look forward to hearing about what wonderful things come along with such an honor. In regards to the grading and holding students accountable for not passing in homework, I'm interested to hear more on the subject. I've been struggling with students who just don't care about their homework and giving them partial credit (or fifties in most cases, since they don't complete the assignment). Lunch sessions where the assignment must be completed seems like a great way to get the idea that homework is given for a reason and it must be completed. My son's middle school does not take points off for late work. School policy is every student mus turn in the work and the student has to be given a grade. The reasoning behind it is students won't learn the standards the homework was assessing and that lack of learning will effect the state testing scores. As a teacher, I understand the motivation. As a parent, it irritates me. My son will wait for the last minute to do anything. He could care less about going to lunch detention or being sent to the hallway to finish work. He just plays the game and pushes the boundaries. It is frustrating because he is not learning the lack of work will effect his grades. He is not learning that, in college and "the real world," there are no lunch detentions. My daughter's middle school did the same thing, and it has introduced struggles in high school. However late work carried no penalty, behavioral or otherwise, so of course she didn't learn to turn work in on time. No matter how much I tried to warn her high school would be different, she didn't believe it until she got zeroes. I see your point about lunch detentions in college and the real world, but likewise, as adults, they don't receive such punishments for other poor behavior—they'll be fired, arrested, etc. I don't know what the solution is, because motivation is essentially intrinsic, and I don't know how you fix that. If you discover it, let me know, and I'll try it on my daughter. Congrats on the award. I'm curious about Scanlon's presentation on nonfiction and rhetoric. Any resources/specific tips he presented that you might share? Sure, Lisa. I can scan it and e-mail it to you. I hesitate to scan it and post it without permission, but I don't think he'd mind if I sent it to you. It's pretty big, so I will scan it using the copier from work, which is much quicker than my home printer/copier/scanner. I hate for you do all that work. 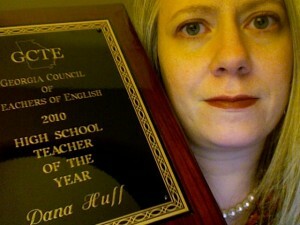 But, I'd love anything you could share with me: lhuff[at]batesvilleschools[dot]com. Thank you. Thank you. Thank you. For those who are interested more in the grading workshop, you can see the PowerPoint Laura and I used on our blog: lizselfandlauracook.blogspot.com or email me to get in touch with Laura. Glad you enjoyed, Dana, and thanks for sharing! Oh, Liz, thanks for the link. I remember you provided it when you gave your presentation, and I forgot to include it. I will revise the post to include the link in case readers don't see your comment. Congrats again! What I find interesting is that I've never known about GCTE. I'm a member of NCTE, but no info has ever crossed my desk on that! How does one join? Jan, GCTE membership is really inexpensive and includes subscription to their newsletter Scribbles 'n Bits as well as a membership discount for the annual conference. You can join by printing the membership form at their website. Congrats on your award Dana! By reading your blog, I can tell it was well-deserved. All of the sessions you attended cover things that my colleagues and I have been discussing the past few months. I'm personally having a hard time with the idea of not penalizing students for late work, not only because that's not how it works in college, but because when I was a high school student — we were penalized. What makes today's students better/privileged/etc that they aren't held to the same standards of behavior, etc that we were in the 1990s? On the other hand – I would also be interested in the ideas you heard about from the non-fiction session. I've struggled to figure out how to incorporate more non-fiction in the classroom. Any new suggestions would be greatly appreciated.